By Arden Moore, a dog and cat behavior expert and author of 26 best-selling pet books. She hosts the Oh Behave Show on Pet Life Radio and is a writer for Pets Best Pet Health Insurance, a dog insurance and cat insurance agency. Okay, time for a little canine potty talk disclosure. I can predict with 100-percent accuracy when Chipper, my Husky-Golden Retriever mix, is about to poop. Seconds before, she circles a few times clockwise and may do a couple short hops before getting into the perfect position to take care of business. I’ve also noticed when she is tired or investigating a new doggy bed, that she will circle the bed before unleashing a sigh and plopping down for a snooze. All this circling action displayed by our dogs is enough to make a person dizzy watching – and a bit bewildered. 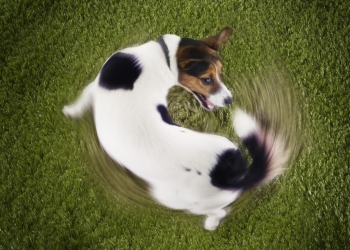 So if you’re looking for an answer to your dog’s spinning behavior, check out the four reasons below. So what is the reason for this pre-bathroom ritual? We don’t know for sure, but here are two leading explanations regarding the circle-before-pooping ritual. Your modern-day dog still retains this 360-degree movement that prevailed in her ancestors who lived in the wild. Circling before squatting down was a smart way to survey the surroundings for safety. It allowed dogs to sniff for possible predators and avoid any surprise attacks while in a vulnerable posture. The second reasonable explanation, is that your dog needs to kick start the bowel movement. It’s possible that circling helps accomplish this. Now, let’s address the circle-pawing ritual performed by some dogs about to nap. Your dog is cleverly circling to release her scent that serves as an aromatic alert to other dogs. It serves as a signal that this bed belongs to her, and her alone. She may methodically circle and paw the bed before plopping down to sleep because this behavior has also been passed down for generations. Her ancestors living in the wild would circle and paw at twigs and leaves to create the perfect sleeping area and the right bowl shape to fit their bodies. This also made it more difficult for potential predators to see them. For most dogs, circling before pooping or sleeping is harmless and even a bit amusing. However, some dogs may circle constantly to the point of ignoring food or sleeping. In these cases, a thorough veterinary examination is required and anti-anxiety medications – coupled with behavior modification – may be warranted. Finally, let’s “decode” the happy spin. For some love-their-people dogs, the sight of their favorite person walking in the door after being at work or returning from a vacation, puts them in tail spins– literally. They display their excitement by spinning quickly, prancing up and down — and some even let out happy, greeting yelps. Being the recipient of this happy circle can make one feel like a rock star. So enjoy the performance!